Despite a vigilant campaign of secrecy at Sony, audiences managed to catch wind of After Earth's big twist: that the once-beloved, now-detested M. Night Shyamalan directed the movie. The futuristic Will Smith vehicle—the year's second Scientologist-headlined abandoned-earth project, after Oblivion—made a not-so-spectacular $27 million, presumably because large swathes of ticket-buyers fled the theater and demanded refunds once Shyamalan's name flashed onscreen. 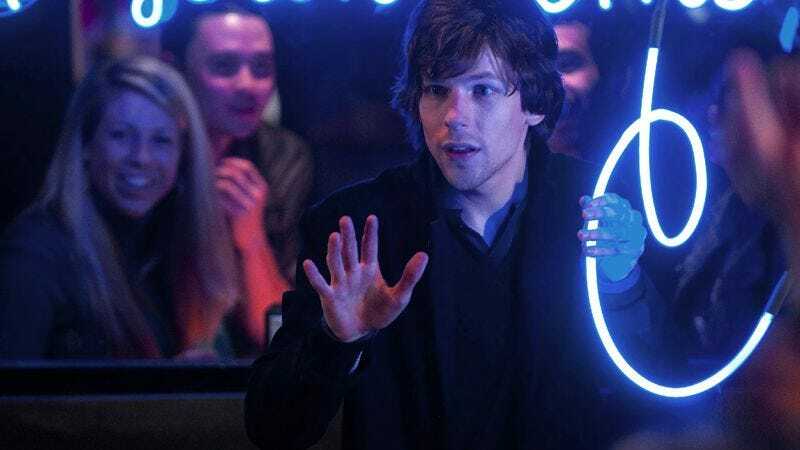 Since they were already at the theater, said ship-jumpers must have then decided that a movie about Jesse Eisenberg doing magic and robbing banks was an okay alternative. Now You See Me, which has a pretty Shyamalan-worthy twist of its own, ended up making about $28 million—only a hair more than After Earth, but enough to be considered a surprise success, given its modest budget and the fact that it's about magicians who rob banks. Hollywood hierarchies are surely being shuffled. In an after-After Earth landscape, Eisenberg will now star in a series of July 4th blockbusters, while Smith will henceforth play only nebbish, stuttering geeks. Neither Copperfield's 11 nor Wild Wild Earth could compete with Uh Guys, They Got A Tank, which took a big dip in its second week to $34.5 million, but still made enough to win the weekend. (Claims made in this column six days ago that the Fast & Furious franchise would soon become so successful that America would mindlessly destroy all other movies in a Fahrenheit 451-style blaze may have been…premature.) F&F6 wasn't the only holdover to dramatically lose momentum. Nearly all of the summer's movers and shakers took a fall, percentage-wise. While Star Trek Into Darkness and Epic tied for fourth place with $16.4 million apiece—a statistical improbability that the universe's leading Vulcans are now investigating—The Hangover Part III sobered up to a measly $15.9 million. Right now, Todd Phillips is nursing a Blood Mary, holding his head, and whispering to himself, "never again." Hovering outside of the ten top were two of the year's best films, Frances Ha ($552,000, on 133 screens) and Before Midnight ($431,000, on 31 screens). Both are pulling solid numbers, but have a long way to go to catch up with the year's big indie success story, Mud. The boyhood adventure yarn has made $16.8 million in 6 weeks, which proves either that America is finally catching up with Shotgun Stories or that it just likes to see Matthew McConaughey take his shirt off. Probably the first one.